This is the 3rd such event I’ve done with Heal’s and I’ve always come away so happy to have shared skills with absolutely brilliant printers-in-the-making. Using the bold, dynamic shapes and bright, summery colours that feature in the K//M//J//C for Heal’s limited edition collaboration of printed Tea Towels I help customers to design their own 3 layer print and teach them the fundamentals of silk screen printing. All in a speedy half an hour’s work! Workshops will be at the Heal’s Flagship Store throughout Monday the 4th and Tuesday the 5th April, and again Monday the 11th. If you fancy learning yourself you can book on the Heal’s website here or email hello@katiecharleson.com for more information. If you’d like to go a step further and really get to grips with designing and creating your own textile prints, I’ll be doing upcoming classes at Bainbridge Studios. Join the mailing list for more information and stay tuned for some exciting news about an upcoming pop-up shop! For the last few months I have been working on a very exciting & special project with Heal's, creating a collection of exclusive limited edition printed tea towels. Inspiration came from collecting different lines, brushmarks and shapes, then collaging and layering them. The most important element, as always, were the colours and how they sit together to create beautiful juxtapositions. My first love is screen printing and I really enjoyed the process of maximising the tactile quality of screen-printed textiles, coming up with designs that were vibrant, colourful and fun. The prints, although functional as Tea Towels, I also see as fun, vital and vibrant artworks in their own right. The different marks and shapes give the pieces energy and the colours make them fresh and summery. This limited edition collaboration with Heal’s was about finding the shapes and colours that combined to create the most sunny energy and vibrancy. I love combining colour in unexpected ways, using tone to make potentially jarring colours work together, creating designs that one would want to keep as a piece of art, as well as being a functional item. The designs are in store this weekend, when I will be at the Tottenham Court Road Flagship Store, teaching some lovely customers how to screen print their own K//M//J//C tote bag. I'll be doing classes from 11:30am until 4:30pm Saturday the 6th and 20th of February. There are still spaces for classes on the 20th, so sign up and come learn the technique for yourself! I have always loved Victoriana and Botanic Gardens. There is something intangibly fascinating about containing something so vital and wild within something so rigid and structured. This is never more true than at the Palm House in Kew Gardens, where I found such beautiful compositions I was inspired to take out my camera that chilly, crisp, February day! This week a lot of time has been spent screen printing orders for cushions and tea-towels in my studio space in Bermondsey; Printall Studio. Central to K//M//J//C is the hands on, tactile nature of screen printed textiles. I love layering up colours and textures intuitively and screen printing allows me to do this while balancing the composition and tone of the piece. I can use screens to make one off, limited edition samples or set up a production line to make the same design repeatedly. Pigment printing is the most fundamental form of screen printing, and this is the medium I have been working in most lately. By pushing ink through the unexposed areas of mesh stretched over a screen, you can transfer an image onto different surfaces. 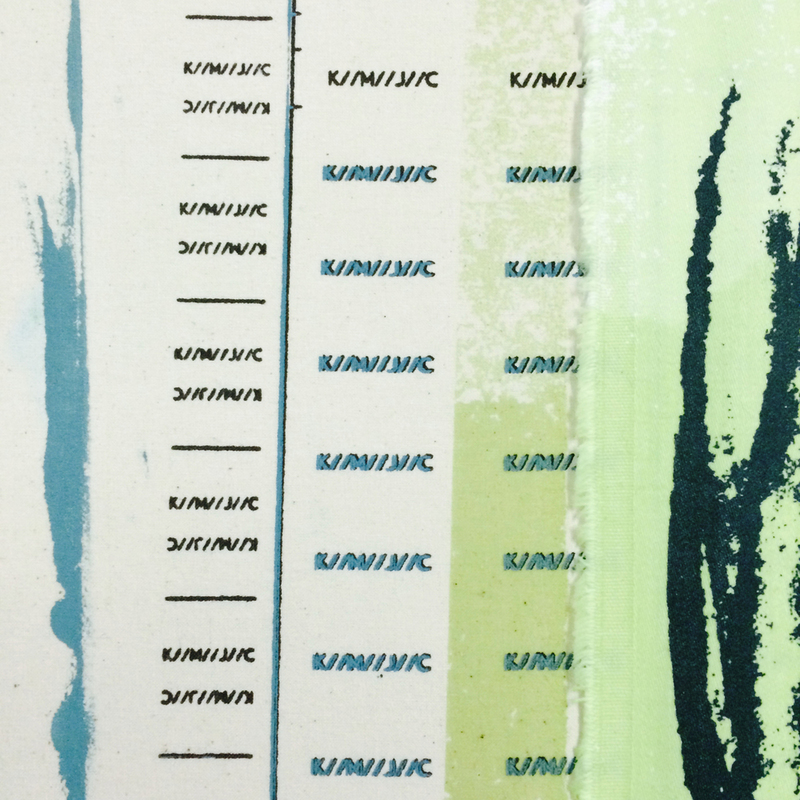 Emerald Oil is a completely screen printed piece of work. Although this is a feature of the design in itself, what makes it really special is the number of colours used. Emerald Oil features 5 colours, not including the base fabric, mixed by eye. Each colour requires its own layer, and therefore its own screen, meaning each cushion cover or tea-towel is printed on 5 times before it is finished. I am so proud and happy to be able to put this level of care, skill and attention to detail into every product I make. And to be able to do it in surroundings that inspire me is the biggest bonus of all! 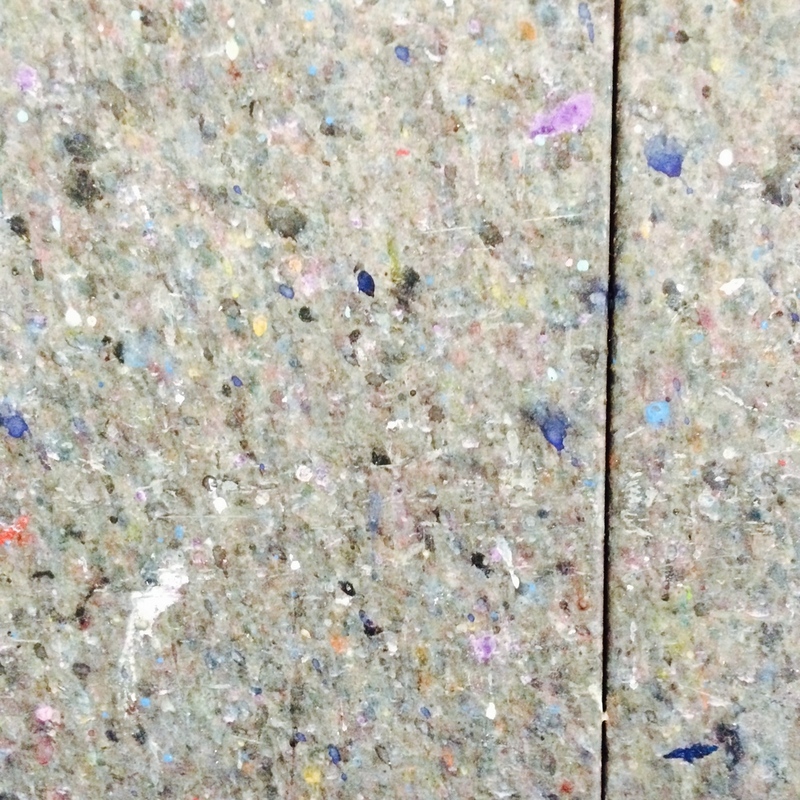 Just look at these gorgeous textures and patinations found in the studio. K//M//J//C is born of a love of colour, a fascination with texture and a passion for print. Original artwork, textures and colours used to create the Debut Collection 2015.